78 x 58⅛ in. (198.2 x 147.7 cm.). Estimate on Request. © Christie’s Images Limited 2018. 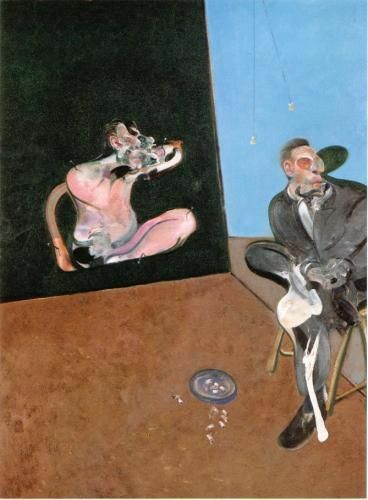 Francis BaconTwo Studies for a Portrait of George Dyer (Sara Hildén Art Museum, Finland), Francis Bacon’s Study for Portrait (1977, estimate on request) will star in Christie’s Post-War and Contemporary Art Evening Auction, which will take place on 17 May 2018. The powerful large-scale eulogy to his great muse and lover George Dyer was painted in Paris in 1977 and was last exhibited in London the same year at the Royal Academy of Arts in a group exhibition titled ‘British Painting: 1952-77’. A poignant celebration of his most important subject, Study for Portrait will be on view in London until 15 April, the first time it has been seen there since the show at the Royal Academy over 40 years ago. The work comes from the distinguished collection of Magnus Konow, who acquired it from Bacon through Marlborough Gallery shortly after its creation in 1977. This therefore represents the first time the work will be offered at auction. As a young man, based in Monaco, Konow built an impressive collection of works by School of London painters, and particularly admired Bacon, with whom he became friends during the 1970s. In 1983, Konow gifted a triptych of George Dyer, Three Studies for a Portrait (1973), to the Israel Museum in Jerusalem, where it remains in the permanent collection. At the time that Bacon and Konow developed their friendship, Bacon was a regular visitor to Monaco from Paris, sometimes with Lucian Freud, staying with Konow for bouts of gambling in Monte Carlo. Widely exhibited internationally, the work represents the culmination of Bacon’s painterly language during one of the most significant periods of his practice. The work’s saturated colour fields and stark geometries border on abstraction. Bacon plays with different textures of black, offsetting the matte backdrop with the lustrous central panel. The pale lilac ground, rendered in thin pigmented layers, is juxtaposed with bright accents of blue, canary yellow and red. The billowing shadow, formally at odds with the figure, spreads across the surface like tar. Circular lenses, derived from a book on radiography, punctuate the figure as if attempting to bring his form more clearly into focus. The flesh itself is an ode to carnal pleasure, wrought with fluid, tactile brushstrokes, spectral veils of white and scumbled strains of colour around the eyes and mouth. 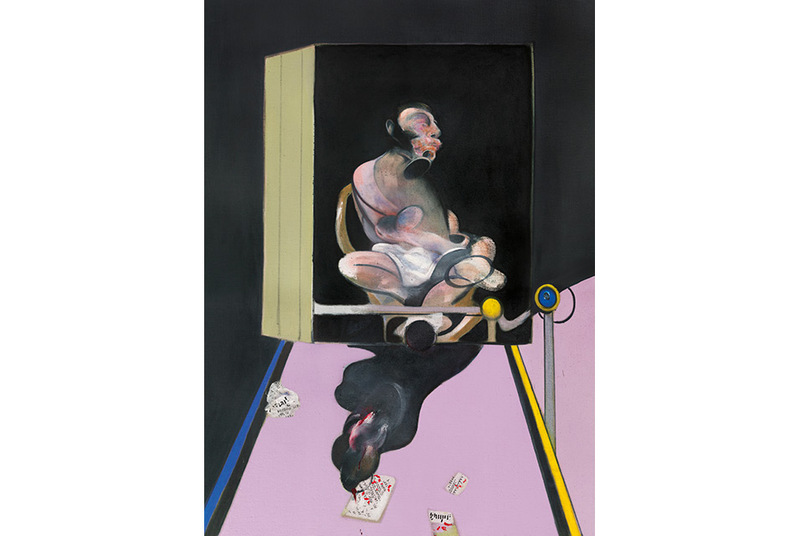 It is Dyer in his prime, flickering like a projection or an x-ray, presiding over the composition with the tortured grandeur of Bacon’s former Popes. Raised upon a dais against a blank, clinical abyss, his quivering form speaks to the transient nature of the human condition. Magnus Konow’s family roots are in Norway: his father was a celebrated Norwegian Olympic sailor, who competed in multiple Olympics between 1908 and 1948, winning two gold medals and one silver. His paternal grandmother, Dagny Konow, sat for Edvard Munch during the late 1880s.